An acute (sudden onset) bout of neck pain is common. Two out of three of us will have neck pain at some time in our life. In most cases it is not due to a serious disease or neck problem and often the exact cause for the pain is not clear. This is called ‘non-specific neck pain’. Most are probably due to minor strains or bad posture. If the pain is persistent, getting worse or you have suffered trauma please see a GP or Chartered Physiotherapist. Otherwise here are a few ideas to help you avoid becoming a statistic. Head is balanced on vertebral column with chin in and back of neck lengthened. Neck muscles relaxed. Open posture with chest leading and shoulders back creates correct balance between neck, shoulder and upper limb muscles. Head sits anterior to body with jutting chin. Neck muscles support weight of head leads to tension in neck muscles. Shoulders rounded, chest muscles shortened and tendency to hunch shoulders increases the risk of developing a work related upper limb disorder. If you are experiencing pain and you are office based it is essential you have a review of your work station. 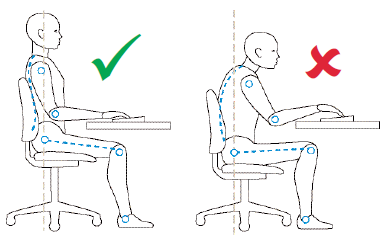 Subtle adjustments in your sitting posture and working patterns can make a big difference. The latest trend is for big handbags . . . The average weight of a typical handbag has increased by 35% over the last five years, with the average bag now tipping the scales at around 2.5 kilos – the equivalent of a standard-sized house brick. and your neck muscles will tense to support the bag. You may not feel discomfort immediately but over time the effects can be cumulative and may result in neck pain. Comfort: From a more subjective perspective, pillows create a feeling of comfort, which aids in getting a good night’s sleep and feeling well rested. 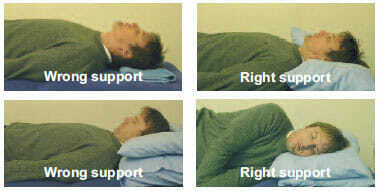 To support your neck it is important that your head is in line with your body with your neck supported. One or maybe two good feather pillows (depending on your shape or sleeping position) will usually be adequate. The pillow can be bunched under the nape of the neck to support the spine. There are a number of specialist pillows on the market which may be appropriate if allergic to feathers. The same principles apply. Upper limb weight training or ‘core’ abdominal exercises without proper instruction can sometimes cause or aggravate neck pain. A Chartered Physiotherapist will be able to give you guidance on the correct technique, program and exercise progression. One of the main causes of posture related neck pain is getting stiff and stooped in the trunk (mid back) and tight across the chest muscles. The neck compensates for this leading to a ‘give’ and strain with potential for injury. To avoid this . . .
Be aware of good posture! Get your friends colleagues to prompt you if you are slouching or stooping. A physio may well use tape to assist you in keeping a good posture. There are posture aids available on line. Remember to change your posture regularly at your work station by taking mini breaks regularly – at least five minutes every hour. Attend classes such as Yoga or Pilates. It may be worth getting some one on one advice from a Chartered Physiotherapist trained in Clinical Pilates or Pilates instructor first to make sure you get a grip on the basics before entering a class. Don’t reach – always keep the load close to you. Don’t twist – keep your trunk in line with your hips and feet. Don’t bend or stoop – use the strong muscles of the legs to lift, push and pull. 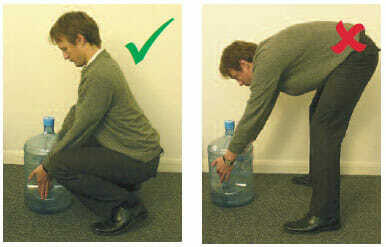 Use a lunging or squatting action by bending the knees and hips. Keep your low back and neck in a neutral, upright posture with particular attention to keeping the chin in, chest out and shoulders relaxed away from ears and elbows by your side. A sustained head down reading posture can sometimes lead to neck pain. Try to sit with your back supported and with your trunk, neck and head in a relaxed upright posture. The same posture principles apply to reading as when you are setting up your work station.